I was at Walmart last week and one of the items on my list was body wash. Dove is my favorite, and Ibotta had $2 back on two Dove products. Anyway. 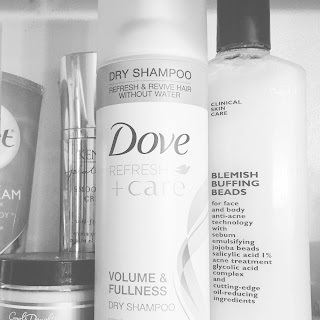 At first I was just going to get two bottles of body wash, but then I saw that Dove has a dry shampoo, and I was out. I picked up the Volume & Fullness one, and I'm surprised how much I love it. For reference, I use Batiste pretty exclusively. I like that there are a lot of subtle scents to choose from. Plus they have Hint of Color options. And while I think Batiste is good at making my hair look good, I generally don't like touching my hair when it's been dry shampooed rather than actually cleaned. I wouldn't say the Dove dry shampoo presents a huge deviation from that sentiment, but I do think my hair feels better with it than with Batiste. Plus it has a nice fresh scent and really does help keep my day-two hair volumized. With all that being said, I had my hair highlighted right before I used the Dove dry shampoo for the first time, and I'm aware that my hair just behaves differently when it's blonder. So who's to say whether this switch will be permanent? But at least for now, Dove is a slightly cheaper alternative and does a slightly better job.